First level of a hack I'm making. Game Progress = %4.5 Complete 4 Levels Created. ( May 10, 2013 )After 4 months of hard work, I'm almost finished with the demo! You will expect the demo sometime this month! 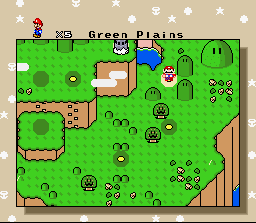 Super Mario World: Deluxe Edition is the new sequal to Super Mario World with amazing gameplay, 72 custom levels, great music, new abilities, and more! What's this? The princess has been kidnapped again? Let's not just stand here, let's go! Bowser has kidnapped Peach and taken her to a mysterious island called Clear Water Island. 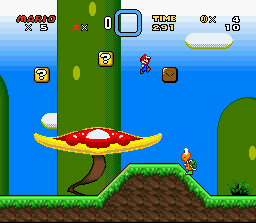 Luigi is on vacation with Daisy, so Mario is on the new quest to save Peach! 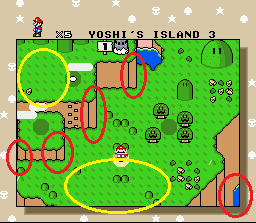 The bottom corner should match the top corner of the hills here (red circles), as in the bottom tile corresponding to the top, should be diagonal as well (matching). The bottom right corner (also red circle), should also match the cliff at the top. The yellow areas on the image are just suggestions for adding more decorations in these spots. Posted on 2012-12-12 02:25:10 AM in LevelASM Problem? When I patched level.asm with xkas into my ROM hack, I get a blank screen on the introduction screen. So, then I deleted my copy, copied my backup, pasted, went on CMD, typed in "xkas levelcode.asm t.smc" Loaded ROM in emulator, then nothing. . When I insert Levelcode.asm, the whole game is blank. How do I fix this? Posted on 2012-12-12 02:59:39 AM in LevelASM Problem? I expanded the ROM to 2MB. Posted on 2012-12-12 03:12:01 AM in LevelASM Problem? That's what I did at first. *Screenshots updated as of 12/12/12. CMP #$32 ;Compares the value. 50 = 32 in hexadecimal. reset: ;If he has 50 coins, set back to zero. 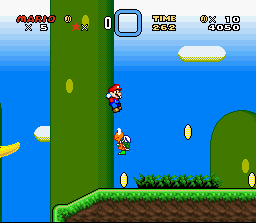 :T If Mario has 50 coins, he'll fly to a bonus level. Just wanted to share. @Storm Kyleis: I were actually going to assume you wanted to check when both A and B are pressed. Anyway, how can I make a sprite use a diferent tilemap when it's facing a certain direction? Most sprites keep track of their direction using $157C,x (#$00 = Right; #$01 = Left), so you can probably take advantage from that one in your GFX routine. If you're looking for an X-flip instead, you just need to use $157C,x to index a YXPPCCCT properties table containing two values, one of which has the X flip bit set (6th), depending on which direction needs horizontal flipping. Haha, thanks. I'm trying to figure out all the RAM addresses and some opcodes. I honestly don't remember. . 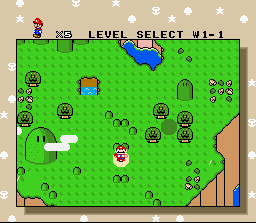 I've played my first hack in 2007 and the only thing I remember from the hack was a bonus level with the Ice Climbers theme. I'm 16 and I'm 6'1 tall. No joke. Can someone help me on doing this? 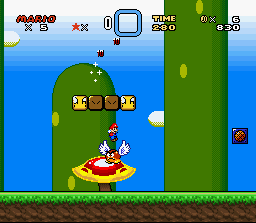 Ex: If Mario is in this type of water, he'll slowly drown to the bottom of the screen. He can tap A to try to get out. Thanks. Thanks, guys. The demo will possibly be finished in 2013.